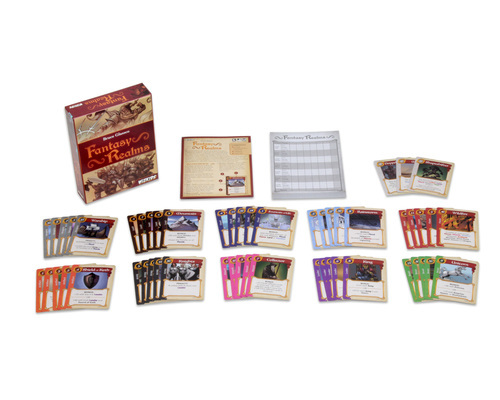 In Fantasy Realms, each player is the ruler of a far-away kingdom, trying to make the best and strongest kingdom possible – being represented by a hand of seven cards. Each of these cards has a base strength, a suit and some form of bonus and/or penalty value. 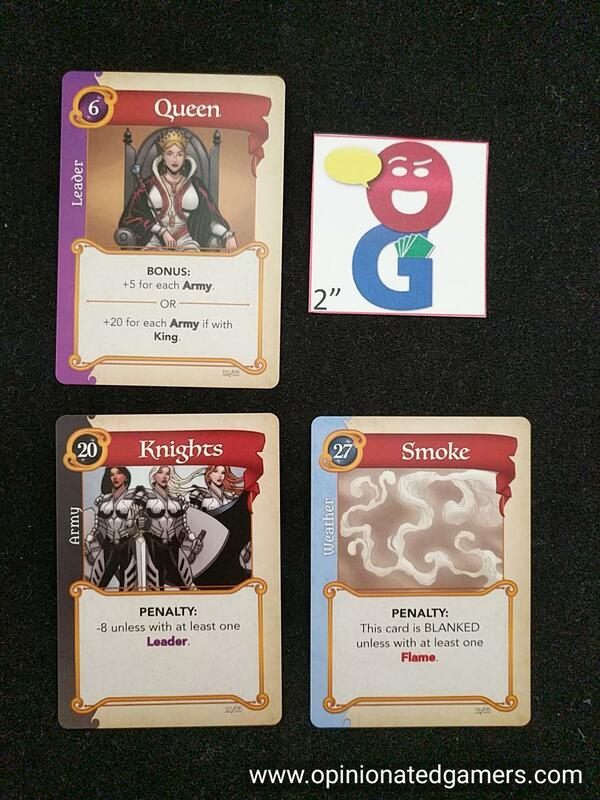 In this game, you will draft from a deck comprised of only 53 different cards to develop your kingdom. Setup: Deal every player seven cards. Choose a starting player randomly and play goes clockwise. Turns: During each player’s turn, he or she has a choice of drawing the top card from the deck or taking any one face-up card from the discard area. The player who goes first must draw a card from the deck. At the end of each turn, a player must discard a card to the discard area. All cards in the discard area should be spread out so that they are visible to all. End of Game: The game ends when there are ten cards in the discard area. The player holding the highest scoring hand wins. In case of a tie, the hand with the lowest total base strength wins. Some cards give bonuses/penalties for each other card in your hand of a particular type or suit – or sometimes even a specifically named card. Some penalties can BLANK other cards; a blanked card has no suit, value, bonuses or penalties – essentially it becomes a card sized piece of cardboard that you happen to be holding in your hand. Other cards will CLEAR penalties. Clearing takes place before penalties are applied if you have both in your hand at the same time. When it’s time to score, the game includes a hefty scoring pad where each player can tally their scores. It’s recommended that you score each of your cards individually. You start with the base value and then figure out if there are any bonuses or penalties scored by that particular card. You will likely have to cross reference the rest of your hand with the scoring of each card. Do this for all 7 cards to get you total. Most of the rules are on the cards, and they are generally self-explanatory. The rulebook does include a short FAQ with 5 specific questions/card rulings in it, but other than that, you’re on your own to interpret how the cards work. In our five games so far, we really haven’t had any issue – and if there was an issue, we voted as a table on an agreed-upon ruling and went with it. 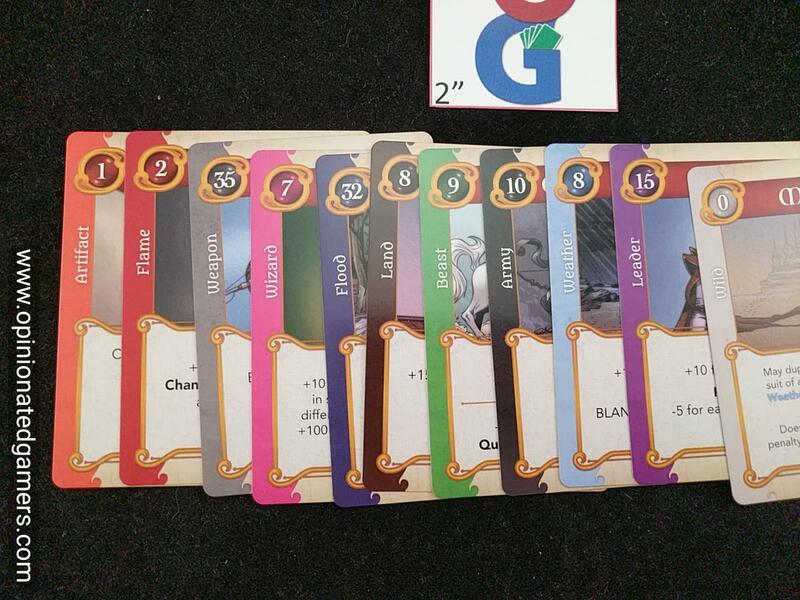 Gameplay can be both quick and glacial – depends on the cards you get and the players in the game. I think it is wise for everyone to take a minute or two after the initial deal to get a chance to look at their cards and figure out what each one does. 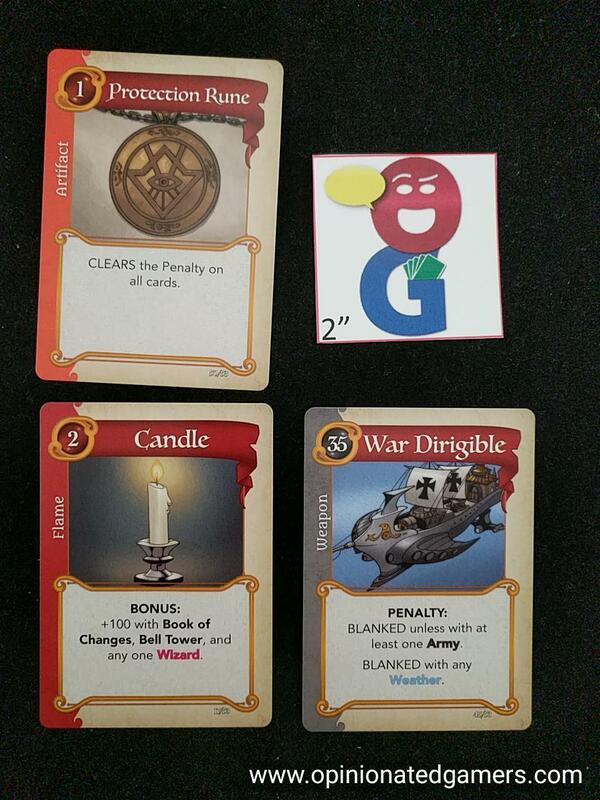 In my experience, you’ll usually find two or three sets of cards that work nicely together. I try to then use these cards as the base for my end-game hand – trying to add cards that work specifically with either, or hopefully both, subsets of cards. Note that the game can end quite rapidly. Each time someone draws a mystery card from the top of the deck, the game is 10% closer to ending – because when the 10th card is placed in the discard area, the game immediately ends. In a four-player game, this could be only 2.5 rounds! Invariably, many of the first turns in the game are draws off the top of the deck as there isn’t much choice yet in the discard pile. Once there are more cards to be seen, then there is usually a bit more trading with the discard pile as people try to incrementally improve their hands – because it’s often a better play (IMHO) to get a card that you know improves your situation rather than a blind draw which may not help at all. As the game can end fairly quickly, I’ve found that I generally use the opening deal in each game to determine my strategy. I find that I’m usually getting between 4 and 7 turns in most games, and that doesn’t give you a lot of time to change your hand – the key here is figuring out which possible combos you can make from the start. You have a few rounds to determine which one is going to be the key for your hand this game, and then work on incremental additions with the rest of the turns. Our games tend to take about 12-15 minutes to actually play and then 5 minutes to do all the scoring. The included scoresheet really does seem to help, but it still can be a fairly cumbersome process. It’s hard to do it simultaneously UNLESS each player gets their own blank sheet and scores themselves. Otherwise, we have found it entertaining to simply go around the table and have each player recite the base value and then bonus/penalty for each card. This tends to build a little suspense as well as we can all see how the scoring totals grow as we continue around the table. The artwork on the cards is OK. I find the artwork to be clean but less polished than similar formatted cards (Dominion, Magic: The Gathering, etc). But, it’s easy on the eyes, and the text is done at a nice size so that the cards are easy to read in your hand as well as being easy to read when in the discard pile in the center of the table. I like the way that each card type and suit in the text is bolded and color-coded – this also helps identification of important facts at a glance. As with most games with scoring that is multi-factorial, it’s hard to know what a good score is until you’ve played a few times. Our winning scores are usually in the 210-240 range now, so I’m usually hoping to look for cards that bring in 20+ points at a minimum on average. Of course, there are many cards which score very little (if at all) but are necessary to grant a huge bonus on another card – for instance, there are multiple cards which score a bonus of 100 points for that single card… but many of the cards used in that combo are worth 7 or less themselves – so everything will have to average out right. Overall, a nice light filler. The game rules can be read out in about 30 seconds. Trust me, you just did it at the start of the review – but then maybe 2-3 minutes more pulling out specific cards to explain the different keywords in the text and to give a few examples on how the cards interact with each other. Then, deal out the cards and play the first game. After gamers have a single game under their belt (15-20 minutes only! ), pretty much all of the interactions should be understood. It’ll take a few more games to get familiar with the possible cards that you might find in the deck, but as there are only 53 cards total, it’s unlikely that it will take long before you’ve seen them all in action in some form. 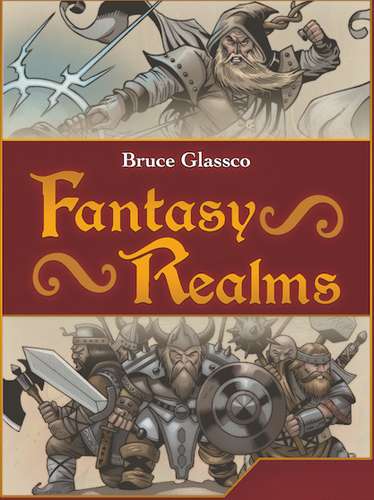 Fantasy Realms has turned out to be a nice filler, and I think that it offers a nice amount of strategy in a small time window. Perfect for opening or closing game night around here as we trickle in and out of the gaming basement. Why couldnt you play 2 players? Honestly, you probably could. Though I’m guessing that there wouldn’t be enough cards available in the pool to make it interesting. We’ve already noticed that difference when we play with 3. When there are only two new cards in the discard pool between turns, it’s feels less likely that you find a card that you want to pick up. Not sure if that is true or not. We have never tried with 2, so i can’t say for sure.